Beautiful outfit! I especially love that coat. It looks comfy, but still really chic. And, happy belated birthday! I actually nominated you for the Liebster award, so feel free to check out my blog, http://forsevenseasons.wordpress.com, for instructions if you'd like to participate! Love this outfit! And that tote is amazing, I've been searching for one similar to the Madewell totes (but less expensive)and this one looks perfect! Beautiful outfit! I love how the scarf really ties it all in! Now I want a gray jacket...haha!!! 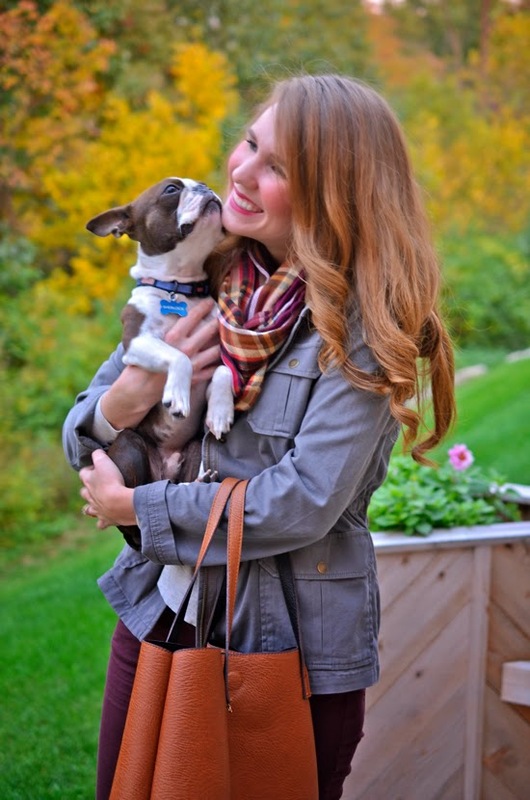 Such a lovely outfit and your dog is sooo cute! So cute! Love that plaid scarf! What a perfect fall outfit! I love everything about, but the jacket and jeans in particular - they look fantastic together! I have seen your tote a few times in your post and really need to find it for myself. LOVE IT! Kind of in love with Cheesecake Factory AND your whole outfit. That bag is specifically amazing.